If you believe the numbers, people are paying more attention to their health and fitness, especially this time of year. According to Statista, more than 170 million people globally have memberships to a gym or health club, with 55 million of those being in the United States. That is a big number, and it can be a big audience for your company if you invest in health and wellness promotional products. Your company can easily take advantage of this momentum by offering giveaway items in the health and wellness category. With a large offering of products across many different price points, the health and wellness category may be just what the doctor ordered for your marketing program this year. Staying hydrated is essential for everyone so water bottles are universal. And with the variety available in promotional items, there is no shortage of creativity. You can find whatever you’re looking for (and a Proforma rep is always happy to help!). From collapsible bottles to combination bottles that include another item or another function to water bottles that keep drinks hot or cold for hours, give your customers something they will use every day – whether it be at the gym or at the office! Help keep your customers prepared for any injury with a branded first aid kid. Perfectly sized to keep in your car, desk, gym bag, fanny pack or backpack during a hike or bike ride, these kits are sure to come in handy as activity levels increase. Golf is a very popular sport and a traditionally popular promotional item category. Golfers (at least those I know) will always take free golf balls and tees because they are easy to lose! Best of all, you can join the trend for relatively little investment. Buying branded golf balls, golf tees, ball markers or golf towels generally only runs a couple of bucks per items depending on your order quantity. Everyone loves free clothes, and choosing an athletic garment is sure to put it into one’s wardrobe or gym wear rotation. Moisture-wicking fabric is very popular right now and not terribly expensive. Look for a reliable brand, like Under Armour, to increase efficacy of your promo product. These are a little more expensive but worth the investment as employees or clients are sure to put them to use. Even if your end users aren’t big into fitness, wireless earbuds are great for travelers too! Yoga is still going strong as a popular workout. Capitalize on it by offering affordable yet usable yoga mats or yoga balls. The large imprint area on these items is worth the price alone! Plus, a yoga mat with carrying case is sure to be seen by many gym goers. Fitness trackers, smart watches and the like get people excited, especially when they get them for free. While a bit more expensive, these promotional products can have great ROI. Higher-end bags are not only great for going to and from the gym but a lot of people will use them for home to office and travel. If you can invest in a good sized duffel, it will impress your clients and employees. They will gladly use it, showing off pride in your brand every day. Are you ready to join the health and fitness trend? 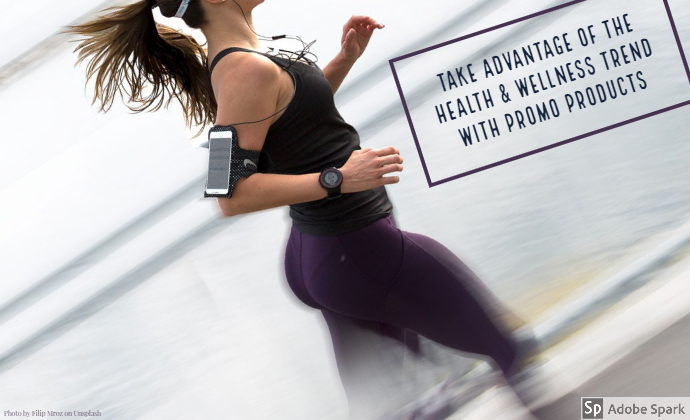 With plenty of people resolving to get fit in the New Year, the first quarter is ideal to take advantage of the health and fitness promotional product trend. Contact your Proforma professional today to fulfill all of your promotional product and marketing needs. Next Article Are You Ready for the 2019 Color of the Year?